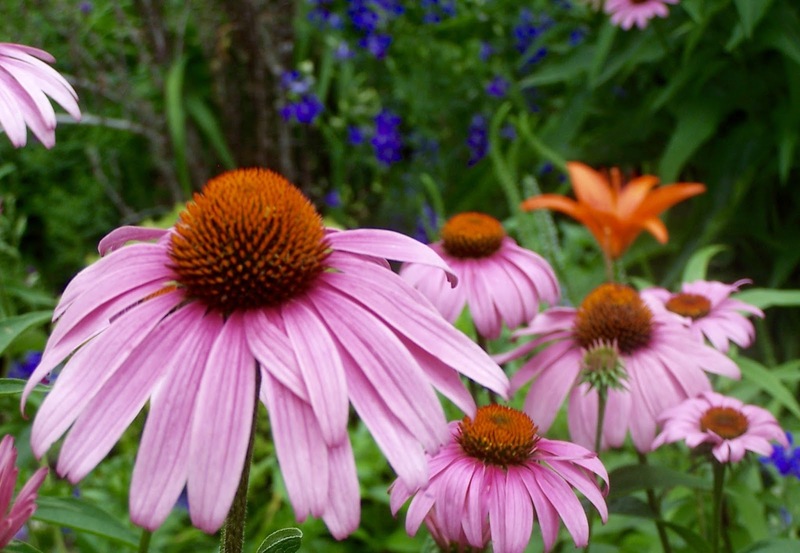 Purple Coneflower grows in the border with orange Asiatic lily 'Enchantment'. 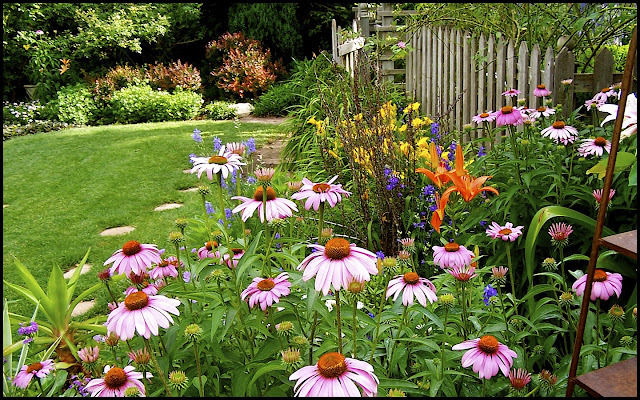 It's a sad reality to us dirt diggers that many of the successes we have in our garden design and plant meets color combos don't always endure. Not all marriages, in life OR the garden, no matter how beautiful and vigorous they once were, will last indefinitely. The synergy and beauty of the coupling gets taken for granted and is eventually left to languish and then fade away. 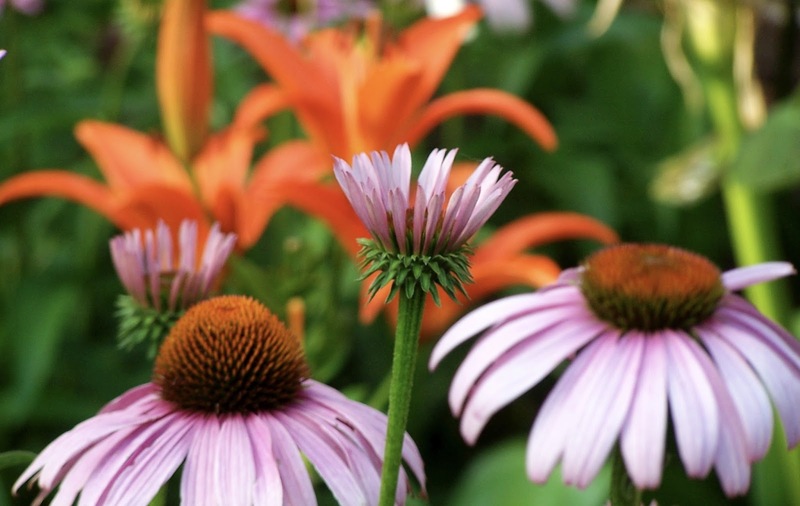 Case in point: the striking pairing of echinacea purpurea, purple coneflower, with the orange intensity and drama of the Asiatic Lily 'Enchantment'. Beautiful color echoes: orange discs at center of coneflower with hint of matching hues in the lily behind it. It isn't a combination I can really take credit for. 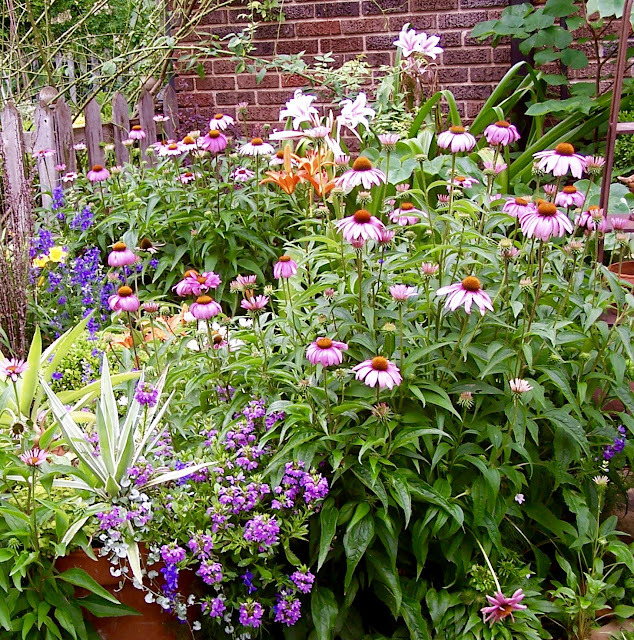 I just planted both in the same general area and when the vigorous stand of coneflower and the number of lilies reached critical mass, their allure and color echoes were nothing short of magical. A gift from Mother Nature not to be denied...or overlooked. Worth nurturing for sure. But of course, season after season, I took its appearance in the perennial border for granted, not noticing that with each subsequent year the combo was losing its zeal, eventually being barely noticeable, much less incredible. Enchantment Lilies with yellow lantana growing at its feet. Time to rethink the formula, the space, the application of this hot color combo which is too effective not to recreate (its previous home is just not large enough any more to create the desired effect.). Bees love coneflower as much as butterflies and humans do. My strategy is to (a) re-establish the voluminous stand of coneflower by not being so heavy handed in dead-heading its spent blooms. I plan to save a lot of seed (it will grow from seed quite easily) and then sow it in another spot in the cut flower area of the potager. 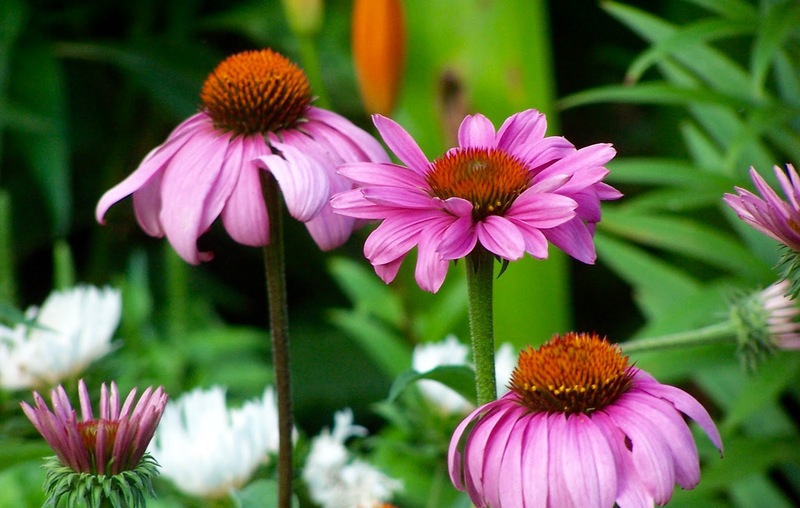 It is my experience that coneflower that matures and grows from seed (just the common purple coneflower) is far superior in beauty and performance to any that can purchased in plant form. The orange sparks shooting out from the center of a purple coneflower. Perfect color echo of orange 'Enchantment' lilies. Once a good stand is established, it can almost be too much of a good thing....but then your garden generosity can kick in. No downside as I see it. 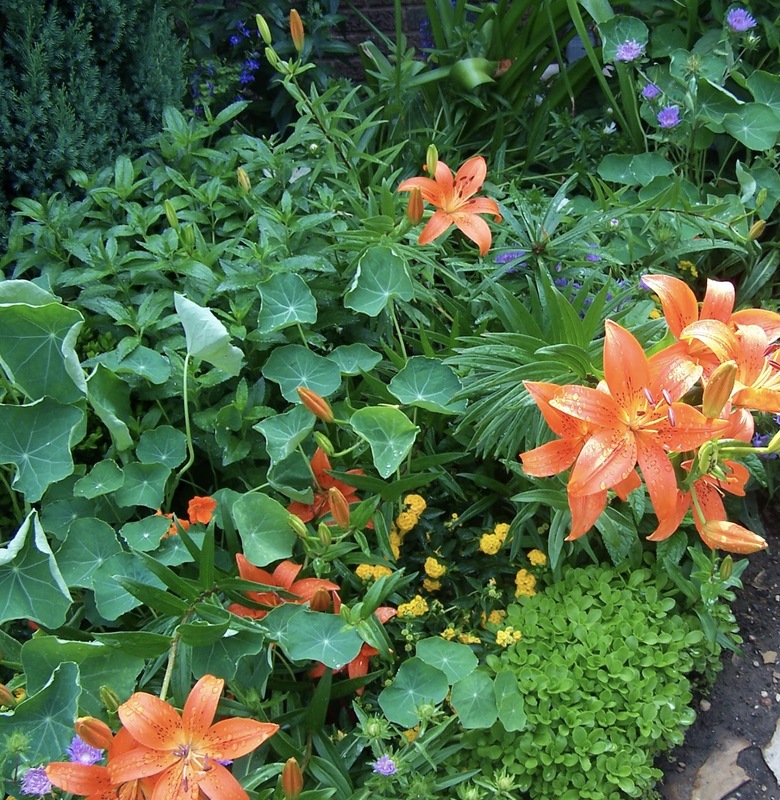 (b) order or buy them (or something equally orange lily intense) from Bulbs Direct(here) or The Lily Garden(here) or a retail source for fall planting...and in greater numbers with vastly improved drainage. Read my post 5 Ways to Use Gravel in the Garden (here) for some tips on this subject. Huge, deep planting hole + drainage amendments = stellar lily performance. Orange lilies look equally as beautiful with blue stokesia and nasturtium in the planting scheme.